When I was going through the freezer last week, I found an un-opened bag of store-bought frozen meatballs that I totally forgot was in there. Thinking about the last time I bought pre-packaged meatballs, I realized that they have been in there since Superbowl Sunday! It was time to use them up! I wasn't in the mood for spaghetti and meatballs, but if I didn't prepare those meatballs soon, I would definitely forget about them AGAIN. I remembered that Joe likes Swedish Meatballs. I've never made them before and I only ate them once when they were served as hors d'oeuvres at a wedding. So, I really had no clue how to make them. Years ago, someone told me that the secret ingredient in their Swedish Meatballs recipe is grape jelly. 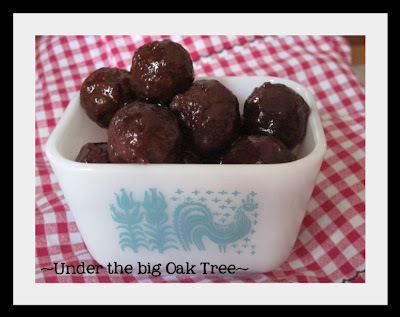 So, I googled Swedish Meatballs with grape jelly. I found many different recipes for Swedish Meatballs. I found a few that I would like to try in the future, but this time, I chose the recipe that looked the easiest and had the least ingredients. The original recipe, posted over at Good Eats 'n Sweet Treats, includes homemade meatballs and I really prefer to serve homemade to my family, but for now, my plan was to use up those store-bought frozen meatballs. Whether you decide to use frozen meatballs from the store or homemade meatballs that you froze during your last OAMC session, this three ingredient recipe really couldn't be any easier! Pour chili sauce and grape jelly in cold crock pot insert. Add frozen meatballs and stir to coat meatballs with sauce. Stir, reduce heat to low and cook for 3-5 hours or until meatballs are heated through. I used the cocktail sized meatballs since that was what we had in the freezer. I'm sure this recipe would work well with the larger sized meatballs as well. I served these as a meal with buttered egg noodles. But they would make a great appetizer for a party or sporting event! I LOVE meatballs! I just made some last week. I like cute food and I find meatballs cute!!! I love swedish meatballs, but have never made them at home. These look delish! OH wow! My aunt is Swedish, and makes them homemade for me sometimes but this would be a great shortcut for when I was craving them, but couldn't get to Chicago to see her!! It always amazes me what I can find when freezer diving! These look good! Ohhhh yum!! I can't wait to try out this...I love all things from a crock pot! :D I would love to have you visit Frou Frou Decor..I love new friends! I would also love to have you link up at my Fabulous Friday Finds party every Friday!! Hope to see you there! I've made a version of this with cocktail hot dogs, but never thought of it with meatballs. I bet it's delicious. Who'da thunk that jelly and chili sauce would go together, LOL!? I love that kind of food. And I love using stuff I unearth in my freezer in creative ways. Can I come over with a toothpick and pluck out some of those meatballs?? p.s. I love the little vintage Pyrex container you've got them piled up in. So cute! I love your blog- my crockpot is my best friend s I will enjoy having a "blog -browse"!! Your yummy meatballs are perfect for our BlogBBQ where we will say, "So Long Summer!" Please bring them over, Sept. 2-6. Everyone would love them! Thanks...and have a good one. I'm visiting from Singing with the Birds' BBQ party. I like them coctail meatball sized so I would leave it just the way you did it. And with three easy peasie ingredients, I will be sure to try these. I have never made Swedish meatballs, but I do like to eat them! These look delicious! Thanks for sharing them on our End Of Summer BBQ! I've had these as appetizers and they are SO good...they go really fast as a party. Thanks for the recipe. Now I will know how to make it myself!